Dreamweaver, which was originally developed by Macromedia (who were taken over and merged into Adobe Systems Incorporated in December 2005), is available for both Apple Macintosh computers and PCs using the Microsoft Windows operating systems. Although the program should arguably be a key part of every professional web designer's toolkit, is probably fair to say that Dreamweaver interoperates especially well with other Adobe (and former Macromedia) tools such as Adobe Fireworks. It should also be noted that templates created in Dreamweaver can also be used with Adobe Contribute, which is a multi-user application that allows several people to work on editing a web site, all at the same time. Although Dreamweaver does have a very clean and well thought-out user interface, simply because it incorporates some many capabilities, it can be quite to daunting to learn how to use, especially for users who lack extensive previous experience in web technologies. However, there are many excellent web sites, software tutorials, and, of course books, that can help new users to master the program. With the help of these types of resources, you might be surprised how easy it is to learn Dreamweaver. Nationwide Speaker & Author Of 4 Books, Brian Wood's Learning System Is By Far The Best Way To Learn How To Build Websites Using Adobe's Dreamweaver Program- With Help Desk - Never Get "Stuck" Again. Incredible Reviews! ...WITHOUT the inconvenience (and expense) of classroom training! Discover Everything You Need To Know To Build Your Website Step By Step From Start To Finish With This Dreamweaver Tutorial. Learn how to plan and set up a website, then dive into creating your first site and learn about CSS and how best to use it in your site. You'll also explore accessibility in tables, writing code, adding media and working with templates. Once you've learned all the ground work and set up your site, Dee will walk you through how to test and upload your site. By the time your are finished with this training, you will have all the skills you need to create and upload your first website. Learn PSD To HTML With Photoshop And Dreamweaver from a professional trainer from your own desk. In this PSD to HTML Using Photoshop and Dreamweaver training course, expert author David Place teaches you the core principles of creating workable websites using these two Adobe programs. This course is designed for users that already have a working knowledge of Photoshop and Dreamweaver. You will start out by creating a PSD mockup using Photoshop. David will teach you about the design basics in Photoshop, layer properties, slicing, and web optimization. From there, you will dive into working in Dreamweaver to transform your Photoshop document into a working website. In Dreamweaver you will explore the process of setting up and managing a website, working with different view modes, and working with images and layout objects. This video tutorial will also teach you some fundamental HTML and CSS rules. Finally, you will work with the Live View in Dreamweaver to test your website. By the completion of this video based training course, you will have developed the necessary skills needed to design, create, and publish a working website. Working files are included, allowing you to follow along with the author throughout the lessons. Reduce learning time by 80%. Learn from a professional trainer from your own desk. Adobe Dreamweaver CS5 is the latest version of what is probably the most popular web design programs. In this video tutorial, the extremely popular and knowledgeable Andy Anderson introduces you to Dreamweaver CS5. Starting with the basics of mapping out your project, you will quickly move into learning the interface of Dreamweaver, the basics of setting up a site, a document, and working with things like text and images and forms to create amazing web pages. Once you have the hang of the basics, Andy takes this video based training course to the next level, with teaching you the basics of CSS within Dreamweaver CS5. Finally, you will move on to FTPing your site to your hosting company, managing and creating templates, snippets, libraries, and so much more. Learn from certified instructor and put the software to work for you in no time! Amazing eLearning presents self-study video training courses for Adobe Creative suite 3 Design Premium. These training courses are perfect for beginners who want to get familiar with Creative Suite 3 essential functions. These self-study lessons are in a format that lets you see the steps in the order they will be performed. Seeing the software in action and hearing instructors narrate each step is far more effective than reading a "how to" book. Textbooks and study guides with boring text and limited images that make learning difficult can't compete with the CD training provided by these courses. You will learn how to work with Creative suite 3 and become familiar with the new interface and other new features in lessons which include full motion video. Learn Dreamweaver CC 2015 from a professional trainer from your own desk. Comes with Extensive Working Files! In this Dreamweaver CC 2015 training course, expert author Andy Anderson will teach you how to create dynamic websites using Adobe Dreamweaver. This course is designed for users that already have a basic understanding of web design. You will start by learning about Dreamweaver basics, then jump into site and file management. From there, Andy will teach you how to build basic site pages and format a Dreamweaver page. This video tutorial also covers text searches and spell checking, working with pages and images, working with page formatting and text, and CSS. You will also learn about snippets, templates, and library items, as well as how to generate links. Finally, you will learn how to pull everything together, including how to create a basic landing page, use spell check, and upload the site. 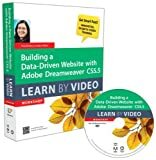 Once you have completed this computer based training course, you will have learned how to design and deploy dynamic websites with Dreamweaver. Working files are included, allowing you to follow along with the author throughout the lessons. Learn Dreamweaver at your own pace. Creative professionals seeking the fastest, easiest, most comprehensive way to learn Adobe Dreamweaver CC (2019 release) choose Adobe Dreamweaver CC Classroom in a Book (2019 release) from the best-selling series of hands-on software training workbooks from Adobe Press. The 15 project-based step-by-step lessons in this book show users the key techniques for working in Dreamweaver while editing and creating HTML and Cascading Style Sheets (CSS). Learn how to create webpages for the modern web; use and customize popular web frameworks to build webpages for a wide variety of desktop computers and mobile devices with a minimum of hand coding; incorporate graphics and text; add links to text and images; add interactive elements to your pages, such as HTML5-compatible interactivity; work with the latest HTML5 and CSS3 code and structures; and publish a finished site to the web. A 16th lesson (online) provides valuable hands-on experience in writing and working with code using shorthand and various productivity enhancements. The online assets also include bonus exercises for HTML and CSS, essential to a full understanding of web design and website development. The online companion files include all the necessary assets for readers to complete the projects featured in each lesson as well as ebook updates when Adobe releases relevant new features for Creative Cloud customers. All buyers of the book get full access to the Web Edition: a Web-based version of the complete ebook enhanced with video and multiple-choice quizzes. Creative professionals seeking the fastest, easiest, most comprehensive way to learn Adobe Dreamweaver CC (2018 release) choose Adobe Dreamweaver CC Classroom in a Book (2018 release) from the best-selling series of hands-on software training workbooks from Adobe Press. The 12 project-based step-by-step lessons in this book show users the key techniques for working in Dreamweaver. Learn how to create webpages for the modern web with a minimum of hand coding; incorporate graphics, and text; add links to text and images; add interactive elements to your sites, such as HTML5-compatible interactivity; work with the latest HTML5 and CSS3 code and structures; and publish a finished site to the web. Four additional online lessons provide valuable hands-on experience in working with code and how to use and customize web frameworks to build a fully responsive site design to support a wide variety of desktop computers and mobile devices. The online assets also include three bonus exercises for HTML and Cascading Style Sheets, and creating web assets, essential to your understanding of web design and website development. That’s 16 total lessons chock full of invaluable information and real world examples. 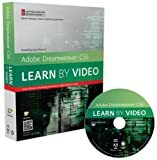 This critically acclaimed product from Adobe Press and video2brain combines exceptional quality HD video and a printed reference to teach the fundamentals of Dreamweaver CS6 as well as the basic principles of web design. Structured around the objectives of the Adobe Certified Associate exam 'Web Communication Using Adobe Dreamweaver CS6', the product includes 13 hours of video, complete with lesson files (included on the DVD), assessment quizzes, and review materials. The video's unique interface allows the viewer to jump to any topic and bookmark favorite sections. The unique Watch-and-Work mode shrinks the video into a small window to allow the student to follow along with the instructor in Dreamweaver. Experienced instructor David Powers shows you how to build modern, standards-compliant websites using Dreamweaver CS6. David starts with a quick overview of what Dreamweaver is used for, then goes into the nuts and bolts of HTML: the language that governs the appearance of web pages, and how web pages are assembled and connected to create an entire web site. He shows you how to add text to a page, then to add images and hyperlinks. To add visual sophistication to the design, David introduces Cascading Style Sheets (CSS) and shows how to add special effects to objects, like rounded corners and drop shadows. Further topics include multimedia (video, audio, and Flash), tables, forms, and managing large sites with many pages. Finally, David shows how to use Media Queries to make your site look good on any screen, from a desktop to a tiny mobile device. This innovative product is a focused video workshop and accompanying 48-page full-color book that teaches web developers how to use Adobe Dreamweaver CS5.5 to code websites that use databases to update pages with changing information. The video begins with a description of the database-driven website process, including installation of the development environment. Then it explains how to pull data from a database and display it in a variety of ways using Dreamweaver features; and how to pass data between pages. The video also covers building an administration interface to insert and update database data using web forms. Experienced instructor, Candyce Mairs presents three hours of exceptional quality video tutorials, complete with lesson files, assessment quizzes, and review materials. The video is wrapped in a unique interface that allows the viewer to jump to any topic and also bookmark individual sections for later review. The unique Watch-and-Work mode shrinks the video into a small window to allow the student to work alongside in Dreamweaver. Project files used in the lessons are included on the disc so viewers can practice what they've learned, and interactive review questions help reinforce freshly gained knowledge. The DVD-ROM is bundled with a printed booklet that provides supplemental material to enhance the video training.